Halibut in Papillote is just a fancy way of saying halibut baked in parchment paper...but it sounds way better the other way, right?! And the best part about it is that it is just about the easiest thing in the world to make! I think this may be my favorite way of cooking fish because the parchment paper traps in all the flavors and aroma so it is incredibly flavorful while at the same time locks in moisture so the fish is never dry. This is another recipe where you can get creative, adding in various veggies like zucchini and squash as well as playing around with different herbs and spices. 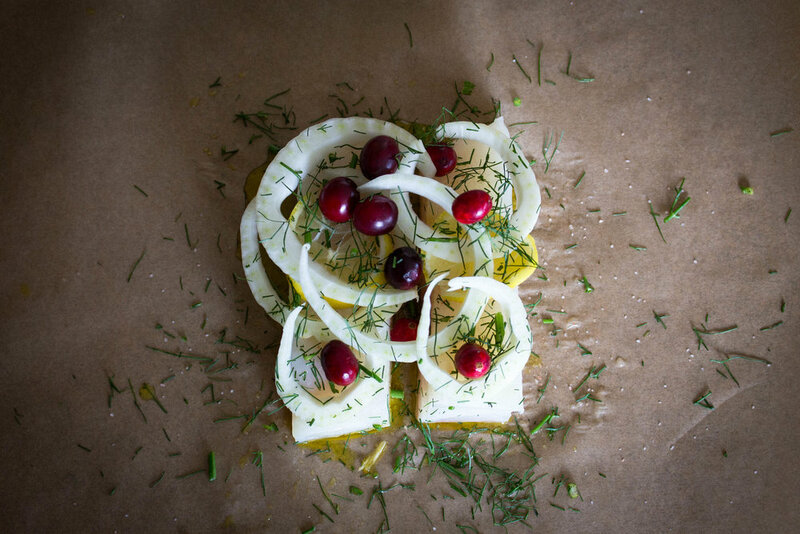 Citrus fruits work great as well in this dish as they add in extra flavor and color plus it smells amazing when you rip open the parchment paper! 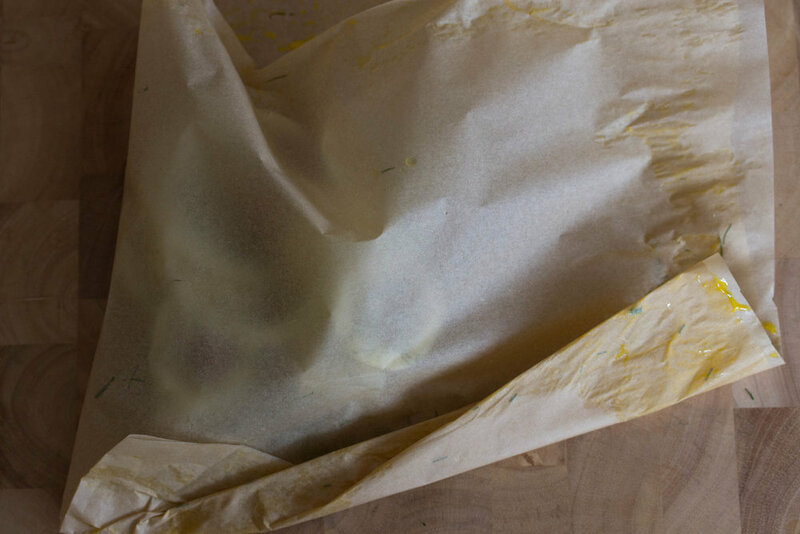 Tear out a sheet of parchment paper (about the size of a cookie sheet or a little smaller) and lay flat on the counter. Pat the filets dry and place them in the middle on the right half of the parchment paper. Season with sea salt and drizzle with oil. 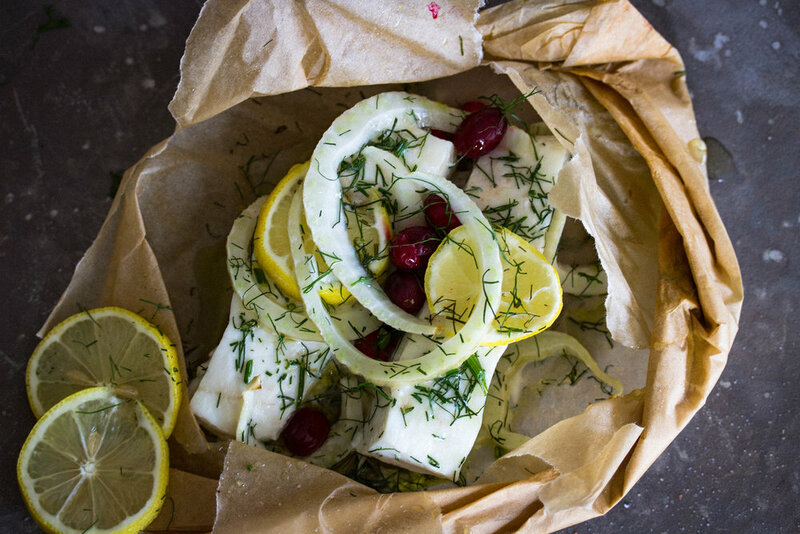 Place sliced lemon on top of fish and cover with fennel and cranberries. To seal the parchment paper, lightly coat the sides of the paper on 1/2 side with an egg wash (1 beaten egg + 1TBS liquid like water or milk). Fold the paper in the middle so that the edges line up and press firmly around the border to seal the edges. Begin to fold in the outermost edge and continue along the entire package, creating a half-moon shape. Once you have folded the entire edges, place on baking sheet in oven for about 10-12 minutes. 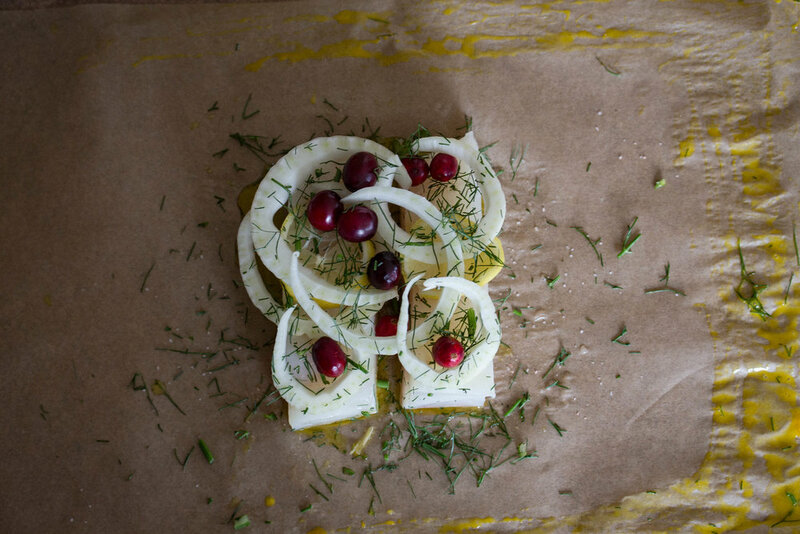 Serve immediately by placing parchment on a plate and cutting into or tearing paper from middle.